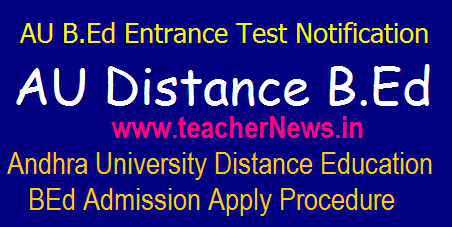 AU Distance B.Ed Admission Entrance Test 2018 Notification in Andhra University SDE ; Andhra University (AU) Distance Education B.Ed (BEd) Entrance Test 2018 Notification AU Distance B.Ed Entrance Test Application form Process 2018 Notification Download @ Andhra University B.Ed Entrance Exam in Distance Mode AU SDE Andhra University Bed Entrance Test 2018 Distance Bed Qualification How To Apply Exam Date Application Form Hall Tickets Syllabus Model Papers, Results 2018 Andhra University Distance Education BEd Entrance Test on 9th, Sep 2018 Andhra University Entrance Exam for Admission to B.Ed. (2- yrs) Programme 2018-19 Applications are invited from the In-service candidates for Entrance Examination for Admission into B.Ed. (2 years) programme for the Academic Year 2018-19 The School of Distance Education (SDE) of Andhra University, Visakhapatnam was established in 1972. Notification of B.Ed. 2-Year Programme Distance Education Admission, Prospects, ENTRANCE TEST - 2018 in AU www.andhrauniversity.edu.in/sde Distance Education B.Ed. Programme Fee Particulars, Exam Pattern, Eligibility and Entrance Schedule download @http://www.andhrauniversity.edu.in/sde/. 1) For admission into B.Ed. programme, the candidate should have passed any Bachelor's Degree (except BFA/BAOL) with a minimum of 50% marks from Andhra University or any other University recognised as equivalent there to. However, SC / ST / BC / PWD candidates need to possess a minimum of 40% marks as per rules of State Govt. of Andhra Pradesh. 2) The candidate must also be an in-service candidate and working in Government Recognized Schools or working in Educational Sector as primary, upper-primary teachers with SGT/ PRT/ TTC / D.Ed. / D.El.Ed. / D.P.Ed. / Pre-primary / Montessori / Fine Arts / any course in Education approved by University / NCTE. * Candidates can also download the application form from our website www.andhrauniversity.edu.in/sde. However they have to pay Rs. 300/- by way of DD drawn in favour of Registrar, A.U. towards cost of application form and submit the same along with the application. Hall-tickets will be issued to candidates in person one day before the commencement of the examination at the respective centres. Note : Candidates, who qualified in Ed.CET need not appear for Entrance Examination and can seek admission directly. The number of seats are limited. Rule of reservation will be followed as per the norms of the University. Rank obtained in the test will be valid for admission into B.Ed. Programme offered by the School of Distance Education, Andhra University for the academic year 2015-16. 1. Service Certificate from MEO/DEO/Concerned Employer. 2. Degree Certificate / Provisional Certificate of qualifying examination. 4. Caste Certificate in case of SC/ST/BC Candidates. 5. Two Self-Addressed envelopes of 11” x 5” size. AU B.Ed Distance Education Admission Notification 2017 AU Distance B.Ed Admissio Application Form Process, AU Correspondence Distance B.Ed Admission 2017 Eligibility, Cut Off Marks, Result, Last Date Apply for AU B.Ed Admission 2017-18.